NEW INFORMATION ABOUT THE CONTEST! As the press service of the Consortium “Space Technologies” said, 15 November 2016 was started the contest among project organizations for the drafting of the orbital station “MIR-2”, the concept of which was presented 27 October 2016 in Moscow. The professional public and private project organizations from all over the world may participate in the contest. Consortium “Space technologies” planned to stop the contest 15 April 2017, but the applications are not did not satisfy the requirements to the project companies. In this connection the Consortium “Space technologies” decided to prolong the contest till 15 May 2017. Consortium “Space technologies” announced, that withw the winner among the project organizations will sign the contract for further work and the allocation of funding under the terms and conditions of the contract. 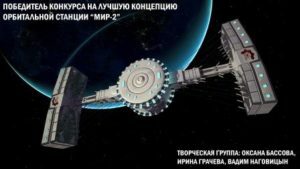 The press service of the Consortium “Space technologies” also said that the project organizations, ready to take part in the competition concept of orbital “Mir-2” station will get the conception of the orbital station “MIR-2” and the requirements. As the consortium “Space Technologies” said, the requirements for the organizations are common: the presence of technical equipment, experience, expertise, necessary qualification and certification of personnel. The project specification will include all stages of the project of the development of project documentation to the requirements for the implementation of developmental and research works, as well as requirements for the organization of work, the procedure for approval and delivery of the project, etc. Suggest your organization to participate in the contest can be emailed arkhipova@kosmotech.org, for more information and to check e-mail delivery + 7495968 30 44/922 85 34.